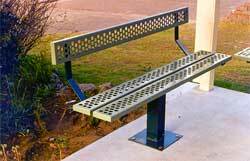 A version of the Park Watcher Seat (see right) that uses perforated steel planks for strength ,longevity and vandal resistance is also available on application. 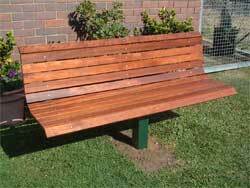 The Boardwalk Seat presents KWILA hardwood battens riveted to a contoured steel frame which in turn is hot dip galvanised and powder coated, to form an exciting park seat. 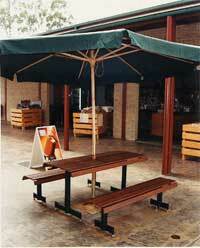 This highly attractive unit is free standing and can be bolted down. 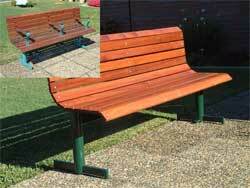 It makes for a comfortable, durable addition to any park furniture situation. The Boardwalk Park Seat is identical in every way to the BOARDWALK SEAT except one, the exception being that this unit has a central mounting post that is made to be concreted into the ground. 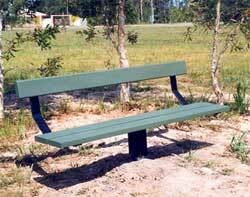 features a galvanished steel frame, painted or powdercoated with Kwila lathes on top. The Slimline Kwila gives an attractive appearance particularly when an oiled finish is applied. 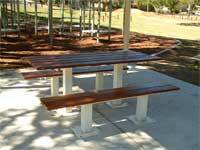 The table and seats can be bolted down or be completely free standing. All feet are adjustable for uneven floors. Optional - extra central hole for Umbrella. 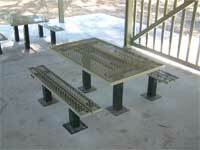 A perforated steel plate version is also available for areas where an all-steel structure is preferred.